This is a hard review for me to write. 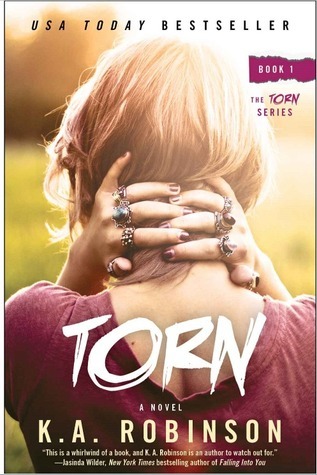 I wanted to like Torn, I really did. It sounded like the kind of book that would pull at my heart and make me emotional. There’s nothing really wrong with the novel (aside from one mistake I caught), it’s just that I was almost bored while reading. And I hate saying that, because I don’t like being bored while I read. I never want a book to be like that. Chloe hasn’t had the easiest time growing up, but now it’s her first year of college and her two best friends are right there with her, ready to start fresh. That new beginning, however, doesn’t include falling for the resident bad boy. There’s a love triangle in this book and I spent the greater part of the novel wishing it wasn’t so. There doesn’t really feel like there’s anything between Chloe and the two guys. One she ended up with because it felt easy and the other because of lust. I’m not saying either of those are bad things, but I don’t like when those situations are written as though it means immediate love. There was a moment when I admired Chloe’s character, but then the ending came and that moment had passed. Drake is the bad boy of the novel. He’s a womanizer, in a band, and has a cocky attitude. Both boys are a little too possessive and neither one really give Chloe a relationship that makes her stronger. It was a little disappointing, to say the least. I think the reason I wasn’t able to enjoy this novel as much as I wanted to was because I just didn’t feel that connection with Chloe. I didn’t understand her motivations or her actions. I felt like an outside reading a novel instead of a fly on the wall. The one mistake that blatantly stood out was that of Drake’s car. The first time we read about it, it’s a 1969 Mustang. The next time we see it, it’s suddenly a 1983 Mustang. Normally I’d let something like that go, but since I wasn’t completely drawn into the novel, it stood out at me. I went into Torn with high hopes. I wanted to enjoy it, but something just didn’t click for me. I’m sure there are people out there who will devour this book; I’m just not one of them. I will be reading the next book, if only because I hope a book with a little less teen relationship drama might draw me in more. Thank you to Atria Books and NetGalley for a copy of the novel in exchange for an honest review. This entry was posted in Contemporary, Young (and New) Adult and tagged Contemporary, K.A. Robinson, New Adult.